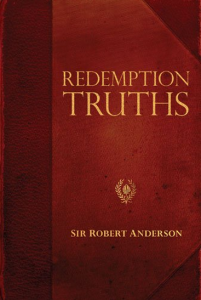 You may have already been the beneficiary of Sir Robert Anderson’s many theological works. An added bonus attached to this publication (Kregel, 1980) is a brief biography written by Warren Wiersbe. Born in Dublin to Matthew Anderson who served as Crown Solicitor for the city and as an elder in the Presbyterian Church, Robert was educated privately in Dublin, Paris, Boulogne, and entered Trinity College, Dublin, graduating in 1862. He was converted hearing John Hall preach, who said to Robert, “I tell you as a minister of Christ and in His name that there is life for you here and now, if you will accept Him. Will you accept Christ or will you reject Him?” Anderson said that after a long pause he exclaimed, “In God’s name I will accept Christ . . . And I turned homeward with the peace of God filling my heart.” Anderson is well known for serving as Chief of Criminal Investigation in Scotland Yard for over 20 years (1888-1901) including the time when Jack the Ripper was terrorizing London’s east side. Because of his personal friendship with Handley Moule, Henry Drummond, James M. Gray, C.I. Scofield, A.C. Dixon, and E.W. Bullinger, Anderson is an early dispensational thinker. Even Spurgeon said that Anderson’s book, Human Destiny, was the most valuable contribution on the subject. His books, The Coming Prince, The Gospel and Its Ministries, Types In Hebrews, and more have been staples to many of us in Bible College and Seminary. Redemptive Truths is a book on the gospel and salvation. Anderson starts with how a sinner can be saved and works his way through to the Bema Seat of Christ.